At the beginning of the twentieth century, Mario Palanti was commissioned by Luis Barolo, a European agricultural producer, to design a statuesque building intended for rental purposes. Expecting Europe to break out into a series of wars that would destroy the continent, a common belief at the time, Mr. Barolo wanted the building to be inspired by ´The Divine Comedy´ so that it could hold Dante Alighieri’s remains once Europe was destroyed. Construction of this regal building full of references to the poet, began in 1919 for what was to be the tallest structure in Latin America. Now a days it is used as office space and as a tourist attraction. Guided tours are available Mondays and Thursdays from 4pm to 7pm and evening guided tours on Mondays and Wednesdays at 8pm and Thursdays at 8.30pm include tasting of an awarded wine and a national delicacy. 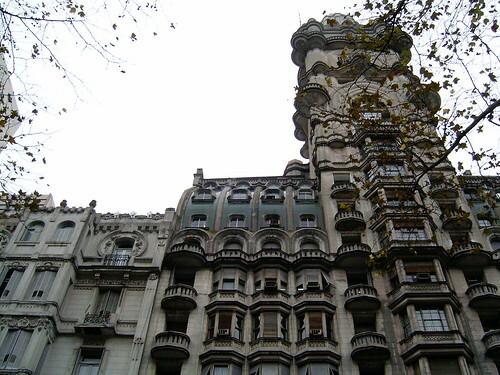 This entry was posted in Uncategorized and tagged Architecture, Architecture in Buenos Aires, argentina, buenos aires,, Must See, Palacio Barolo, recommended places to visit, south america, Thigs to do, Travel by Fierro Hotel Staff. Bookmark the permalink.